Ice Fishing Kokanee | a couple frosty’s on ice! It’s hard to believe that 2010 is gone & that we are already writing our first post of 2011! In keeping with the season we wanted to give you a report on our latest trip ice fishing Kokanee at Monte lake near Kamloops BC. 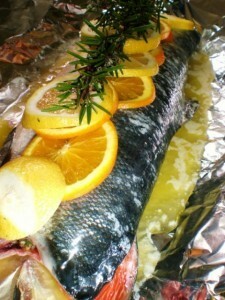 Ice Fishing Kokanee | a bit about this land locked salmon ..
Kokanee are land locked Sockeye salmon. They spend their entire lives in fresh water – never going to sea. 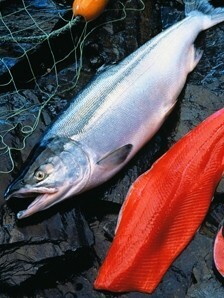 Kokanee are identical to ocean going Sockeye salmon except in size. On average the Kokanee gets to about a foot long when mature, while the Sockeye salmon can reach around 24 inches – Kokanee to around four pounds, however, are not uncommon. Also like their larger brothers, Kokanee have deep red, oily flesh which whether cooked, smoked or canned, makes for high quality and delicious table fare! Kokanee live at mid depths in the open waters of lakes. They feed almost exclusively on zooplankton, which makes them difficult to fish, but will also eat tiny plants, insects, and freshwater shrimp when available. The when is easy, whenever you can obviously, 😉 but most of our experience (so far) has been through the ice so the when, for the purposes of this article, will focus on the BC Interior winter hard water season. In the BC interior the where is fairly limited but a quick check of the stocking charts reveals a few good sources. Bridge lake up highway 24 is famous for producing some lunkers and Wood lake in the Okanagan is also quite popular. In the Kamloops area Tranquille and Monte lakes fit the bill. 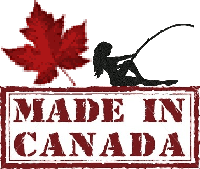 The how for Kokanee fishing is not much different than the how for any still water fishing. 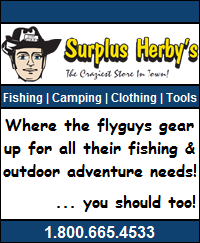 During the open water season you can use the tactics described in our fly fishing overview article and in our trolling the fly article. 1) Think Shiny when targeting this species as these little guys seem to like the flashy stuff. It is not uncommon to find that the use of a little silver spinner or spoon above your lure will make all the difference! 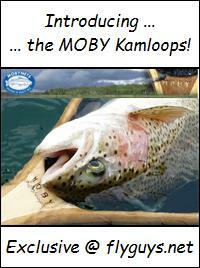 2) Kokanee travel in schools so finding the fish will be critical to your success. If you have electronics that you trust use them to determine where the Kokanee are hanging out, not just in location on the lake but with respect to depth as well. near the bottom of the water column, Kokanee eat microscopic organisms that can be found anywhere in the water column so it is typical to have to suspend your offering for them. That may mean 50 feet down in 100 feet of water, 10 feet down in 80 feet of water, or any combination of water depth to lure presentation. The deeper the water the more possibilities exist, which highlights the importance of point number 2 … find the fish! 4) Once you find them takes can be very subtle so it may be worthwhile to use light gear and hold onto your line with your fingers so you can feel the slightest bump. silver on the outside … red & delicious on the inside! Ice fishing Kokanee at Monte was slow but we did manage to pull out a few silver bullets over a couple of hours. The ice had just recently come on the lake and was about 4 inches thick. We were fishing over 80 feet of water with our lures suspended at 15 feet. The set up that seemed to be working best was a small white ice fly about a foot below a little silver flasher. A nice plump juicy maggot or a piece of shrimp topped everything off. The bites (if you could call them bites) were light at best and if you weren’t holding the line in your fingers you probably wouldn’t have noticed them – we didn’t use a bobber for that very reason! So there you have it. Given that the ice just came on the lake our feeling is that the ice fishing will be picking up over the next week so if you get a chance and our interested in some tasty land locked Sockeye salmon then get out there and give it a go! Oh and be sure to send us some pics and a report! 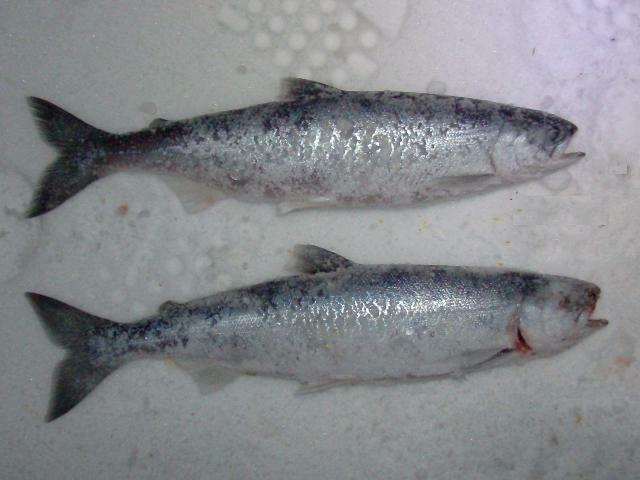 This entry was posted in Fishing Reports, Ice Fishing and tagged Bridge lake, how to fish for kokanee, Ice Fishing, ice fishing for kokanee, kokanee, land locked salmon, Monte lake, Tranquille lake, woods lake. Bookmark the permalink.